A bottle of beer thought to be at least 120 years old which was found by a scuba diver off the coast of Halifax, Canada, apparently tastes “pretty good” . Diver Jon Crouse was scuba diving in the Northwest Arm near Halifax in late November when he discovered the corked bottle of Alexander Keith brand beer, which was almost full, Canada’s CBC News reported. The diver used markings on the bottom of the bottle to trace its origins to a company that imported bottles to Canada from England between 1872 and 1890. The diver had reportedly planned to leave the bottle corked, but when a local brewer, Chris Reynolds, heard about the discovery, he asked Crouse to save the brew for testing. 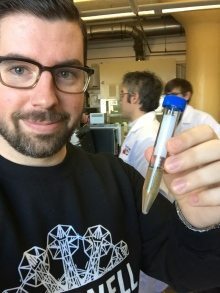 A scientist from the local Dalhousie University then volunteered to test the contents – which were confirmed to be beer. On tasting the centenarian brew Reynolds found that it tasted of “tree fruit, cherry and rotten eggs”. “We were all very giddy. There was a lot of energy in the lab – we were really excited,” Reynolds told CBC News. The testing at Dalhousie University was filmed by a film crew from the Discovery Channel’s Daily Planet and will feature in an upcoming episode of the television programme. The cool, stable temperatures at the bottom of large bodies of water have been recognised for providing ideal conditions for the ageing of wines, and both beers and wines have extreme age have been recovered from seas and oceans and been found to taste perfectly palatable. Indeed some wineries have had clear success from deliberately ageing their wines under water. In March last year the drinks business reported how a bottle of 170-year-old beer recovered from a shipwreck off the coast of Finland was sampled and found to taste “vinegary, goaty and of sour milk”.